The Bangkok Mass Transit System, commonly known as the BTS or the Skytrain (Thai: rot fai fa), is an elevated rapid transit system in Bangkok, Thailand. The system consists of 35 stations along two lines: the Sukhumvit Line running northwards and eastwards, terminating at Mo Chit and Samrong respectively, and the Silom Line which serves Silom and Sathon Roads, the central business district of Bangkok, terminating at National Stadium and Bang Wa. The lines interchange at Siam Station and have a combined route length of 37.6 kilometers (23.4 mi). SUKHUMVIT LINE runs north to east from Mo Chit to Bearing. The two lines meet at Siam Station, and also connect at two points with the underground (MRT) – at Sala Daeng Station (Silom Line) and Asok Station (Sukhumvit Line). A new train arrives every 3 – 6 minutes or so between 06:30 and midnight. The last train leaves between 23:30 and 23:50. Fares start at 15 baht for one stop. Note that trains can get pretty full during peak hours (07:00 – 09:00 and 16:00 – 19:00), as the BTS has also become the choice mode of transport for people living and working in Bangkok. 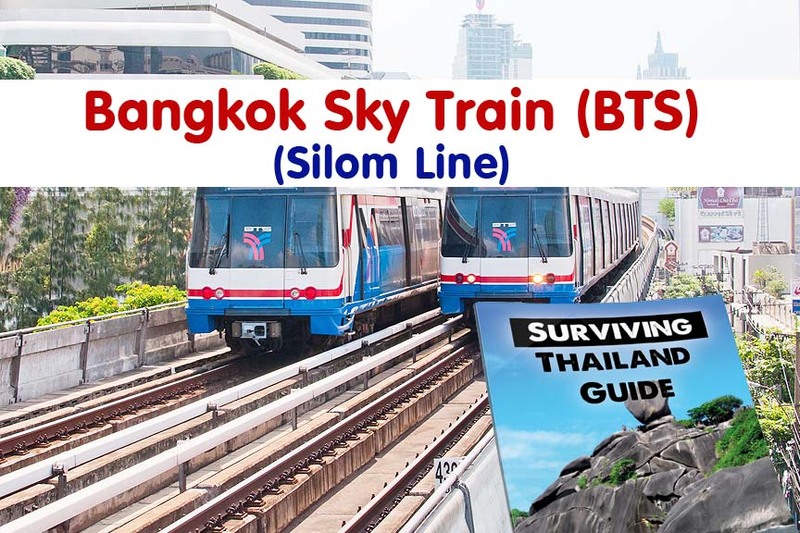 Besides the BTS, Bangkok’s rapid transit system includes the underground and elevated MRT railway lines, and the elevated Suvarnabhumi Airport Link (SARL), serving several stations in the city before reaching the airport. Ratchadamri BTS station, set in one of Bangkok’s most luxurious neighbourhoods, provides access to some of the city’s most prestigious condos and serviced residences. From the platforms, look out to the picturesque fairways and clubhouse of the Royal Bangkok Sports Club (RBSC). These spectacular views can also be enjoyed from many of the luxury hotels and apartments that his exclusive area is well-known for. Ratchadamri BTS is also known to be one of the quieter stations in the city centre. Whilst the immediate Rachadamri area isn’t overwhelmed with too many shopping options and attractions, Sukhumvit Road is just a five-minute walk away or one more stop along the Silom BST Skytrain route. As for eating, there are plenty of fine-dining restaurants in many of the hotels nearby, and some tasty street food options can be found by exploring the side sois (alleyways) off the main road. Sala Daeng BTS Station, busy at non-peak hours and chaotic during the rush hours, is a gateway to Silom’s electrified shopping, dining and nightlife scene at Patpong. It also connects with the MRT Subway via a skywalk. Step off Sala Daeng BTS Station and you will find yourself in the centre of Silom Road, one of the most famous roads for bars, restaurants and street food in Bangkok. For nightlife, Soi Patpong off Silom Road is teaming with bars, discos and go-go bars, whilst the nearby Soi Thaniya is popular for Japanese restaurants and karaoke lounges. There is also a vibrant gay scene to be found here, with a strip of lively gay bars on Silom Soi 4 and a couple of large clubs on Soi 2. As for shopping, Silom Complex (an air conditioned mall full of fashion options and restaurants) is just below Sala Daeng BTS, whilst the locals’ favourite, Lai Lai Sap Market, is walking distance away on Silom Soi 5. Chong Nonsi BTS station, set at the far end of the Central Business District (Sathorn Road), overlooks one of the most picturesque and iconic skylines of Bangkok. It connects with the BRT (Bus Rapid Transport) system.This area, which is walking distance from Silom, has recently become synonymous with fine-dining in Bangkok, with many critically-acclaimed restaurants opening up within walking distance form Chong Nonsi BTS Station. Top picks include Le Du for French cuisine and Namsaah for modern Thai. Ku De Ta is also a popular dining option, and this high-rise venue also transforms into an all-out night club every evening with international DJs in some glamorous settings. 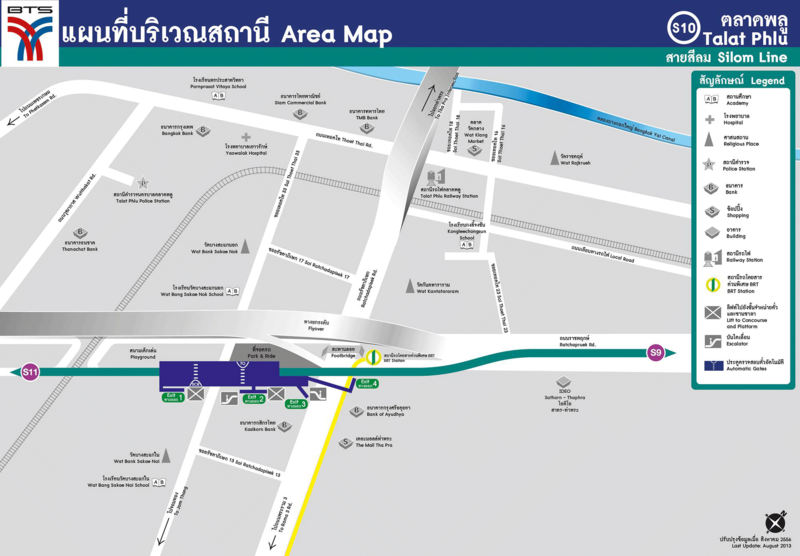 Surasak BTS Station, surrounded by low-key North Sathorn neighbourhoods, comes in handy for those working at nearby offices or staying at one of the serviced residences. The main highlights of Surasak include Blue Elephant restaurant, Sri Mariamman Hindu Temple and Kathmandu Photo Gallery. Surasak BTS Station also has a couple of noteworthy shopping options nearby, including Bangkok Jewellery Avenue and Bangkok Fashion Outlet. There is also an excellent rooftop bar at Mode Sathorn Hotel which offers some great views over the Central Business District. The Chao Phraya River is also just one stop away from Surasak BTS Station, although Saphan Taksin station (one stop away) is closer. BTS Saphan Taksin, the last station before crossing over the Chao Phraya River, connects with the Chao Phraya Express Boat at the Sathorn Pier, as well as the many shuttle boats that connect many of the top riverside hotels to the Skytrain line. It is the perfect launching point for exploring the riverside on both the Bangkok and Thonburi sides. One of the main landmarks at Saphan Taksin BTS Station is the Lebua State Tower. As well as a hotel, this iconic building is home to Bangkok’s most famous rooftop bar (Lebua Sky Bar) as well as several fine dining options such as the world-famous Sirocco restaurant. Bangkok’s only Shangri-La hotel is also at Saphan Taksin BTS Station, which looks out onto the river. Shopping options here aren’t particularly extensive, although there is a big Robinsons Store, while the nearby River City mall can be accessed by taking a free shuttle boat north up the river from Sathorn Pier. Coming from Bangkok, BTS Krung Thon Buri is the first station on Thonburi side, surrounded by mostly residential areas. A short taxi ride from the station will get you to all the luxury riverside hotels opposite Sathorn Pier. Most of the shopping and dining options around Krung Thon Buri BTS are of the local variety, with lots of excellent street food and vendors surrounding the nearby sois close to the station. There are also a few excellent hotel options nearby, including The Peninsular Hotel Bangkok and Ibis Riverside, both of which are a short away from the station. Wongwian Yai Station sits in a dense residential neighbourhood just south of King Taksin the Great Monument. Although off the tourist map, this area has a lively outdoor food market and a wide range of shop-house style eateries. There is also a large Robinsons Department store near Wongwian Yai BTS Station, offering a large air conditioned space with plenty of popular fashion brands and chain restaurants. One of the most prominent landmarks in this area is King Taksin the Great Monument, which can be found at the main roundabout just a short three-minute walk north from the BTS station. Pho Nimit BTS makes even the quieter central Bangkok BTS stations look comparatively hectic. Serving a majority of locals who live, work and study here, this area is one of the least visited on the whole of the BTS line. That said, just like any residential area in Bangkok, you’re never going to be short of places to eat, drink or shop – just don’t expect any mega malls or super clubs too close. This BTS station is just a few minutes’ away from the more central Silom area across the river, although stepping off here and you might feel like you’ve travelled way out to the suburbs. Pho Nimit BTS is located on the main Krung Thon Buri Road which goes across the river into central Bangkok. 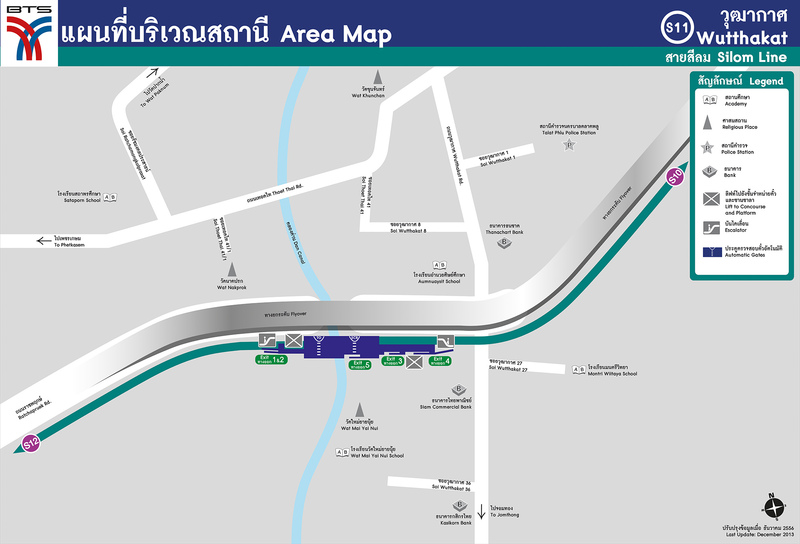 Talat Phlu BTS is located on the main Krung Thon Buri Road and is also connected by an interchange walkway with Ratchapruek BRT Station. Opened in February 2013, this station mainly serves locals who live in the area, as well as commuters and those interchanging with the BRT line. The Talat Phlu area is well known locally for its abundance of excellent street food options mostly centred around Thoet Thai Road Soi 18 and Soi 25. There is also a major mall (Tha Phra) which can be found by walking down the busy Ratchadapisek Road. The area around the mall is home to lots of other shopping options, as well as street food and a few trendy Thai-style bars and restaurants. Wutthakat BTS Station opened at the end of 2013 on the Silom Line and is located on the main Krung Thon Buri Road that stretches into the west of Bangkok. Few foreign visitors get off at this station, which is mainly used by commuters and locals who live, work and study in the surrounding Wutthakat neighbourhood, as well as a few expats. 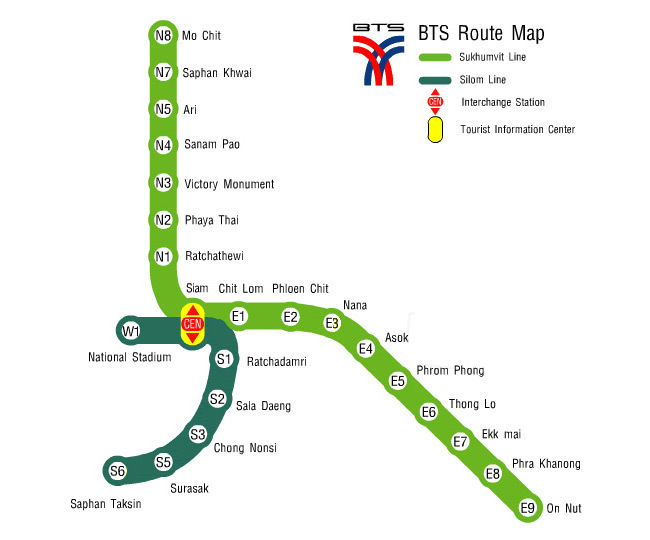 The BTS station sits next to the Bang Khun Thian Klong (canal). However, there are a couple of interesting temples, and whilst finding them might be difficult, it does offer a great way of sampling local life and exploring a new neighbourhood. Bang Wa BTS is the final and westernmost station on the Silom Line, and was opened for public use in December 2013. 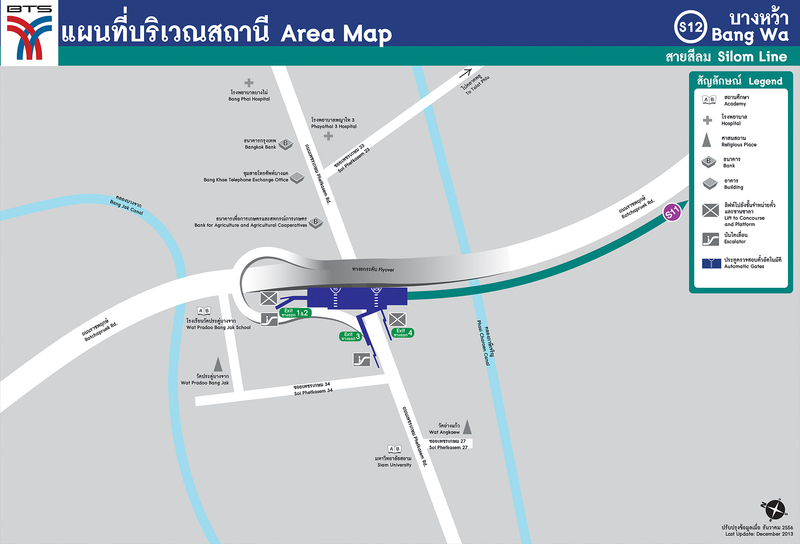 The Station is located on a busy intersection between Petchkasem Road and Krung Thon Buri Road which stretches into the centre of Bangkok across the river. The area is popular with cheap condos and apartments, and there are also local schools, colleges, temples and shopping options serving the local Thonburi community. Please note that there are plans to expand the BTS line even further beyond Bang Wa, although construction is not expected to be completed until 2017 onwards.